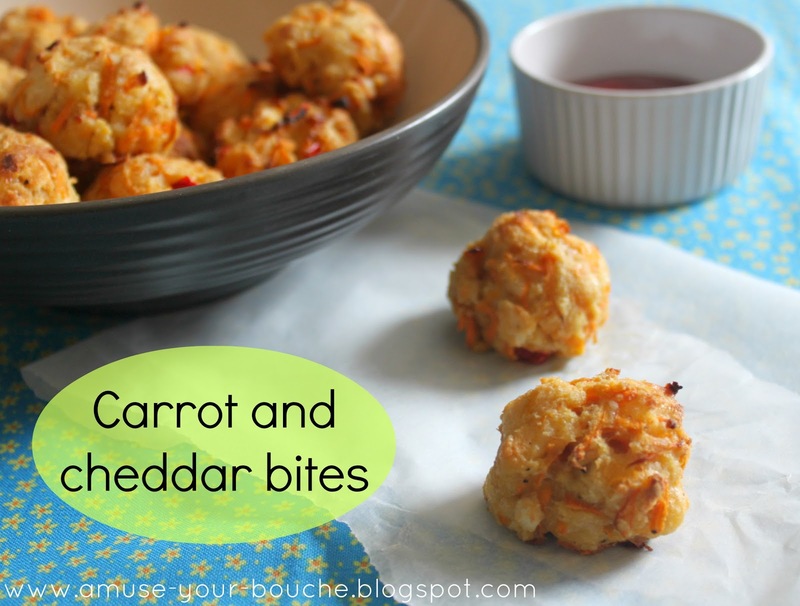 I originally called this recipe ‘carrot and cheddar balls’ but I just knew I wouldn’t be able to get through a post with a straight face, so I changed it. I just about managed to get through writing ‘medium-sized balls’ in the recipe but that’s all I can manage. ‘Bites’ sounds much more pleasant, yes? Anyway, that’s quite enough of that. These delicious little bites would be great as canapés, or just as a fairly healthy snack. As the carrots roast they become irresistibly sweet, and pair perfectly with the flavour of the chilli. Depending on what type of chilli you choose, it might not add much heat (my chilli was pretty mild), but the flavour it adds is great, so don’t skip it even if you’re not a spice fan. Cute aren’t they? But not so cute that I felt at all bad about ruthlessly eating them. It was definitely a case of ‘oh, just one more’. I think this will have to be another recipe on the ‘make again at Christmas’ list. Every Christmas Eve we have loads of canapés instead of dinner (is there any other time of year when you could get away with that? No seriously, I’ll take any excuse) and these are going on this year’s shortlist. Ohhh, plus, how easy is the recipe! My favourite way for a recipe to begin is ‘Preheat the oven…’ because it shows that the prep doesn’t need too much faffing. The next best thing to see is ‘Combine all ingredients’ – can’t get any easier than that. Preheat the oven to 190°C (Gas Mark 5 / 375°F). Combine all ingredients apart from the oil, and mix well. Take a tablespoon-sized portion of the mixture and squeeze it gently into a ball. Lay on a lightly greased baking sheet, and repeat with the remaining mixture. Spray the tops of the balls lightly with spray oil, and bake for around 30 minutes. Finally got around to making these yesterday, yum yum yum! Supermarket only had extra hot chillis and since was for 3 yr old and 1 yr old as well as two adults I thought not. Used two spring onions and some chilli powder instead and was delicious. We ate half yesterday and had rest today,some heated in microwave and some cold cos we were too hungry/impatient to wait. Big hit here with everyone,think it’ll be spinach, feta and mozzarella croissants next! I loved making these! So easy and fun! I tried experimenting with some chives and onion that I had left over and my little green batch came out quite tasty too! My kids loved them too! Thanks! These are pretty darn good. I’m so glad my neighbour grows chillies in his front garden because it was the only ingredient I was missing. I don’t know what type he grows but gave this little ballls, I mean bites, a medium sized kick. Terrific recipe Becca!! I made them… they are a little more dense than yours but were nonetheless, DELICIOUS!! Another great looking recipe that I have never seen before. Thanks for linking up to Saturday Dishes. I Pinned it! Hi Becca! I am excited to try out this recipe – it’s a unique one! I’m wondering… what are these measurements in cups or tea/table spoons? Since other readers have commented on replacing ingredients and the recipe not coming out perfectly, I want to make sure that I use the right quantity of everything! Thank you! Hi Pri, I actually don’t know about cups since I obviously don’t use that type of measurement, and I have no way of finding it out without going out to buy two carrots and grating them!! I would REALLY recomment buying a set of kitchen scales if you don’t have them, they’re really not expensive! Hi Becca! Thanks for the response. I’m curious as to why you don’t use the cups measurement. Is that standard for you? And I do have a scale but I’ve never used it! It was a groupon deal so I bought it. After I try your recipe, I’ll let you know what the measurements are in cups / spoons! xo. so how do these taste room temp or do i have to heat them up? i’d like to take these to an outdoor tea party and won’t have a way to heat them up. I haven’t tried them at room temperature (they didn’t last long enough ;) ) but I reckon they’d be pretty good. Let me know if you try it! I made these tonight. I used a tsp of mild chili. I tasted the mixture when it was just the shredded cheese and carrots and the chili powder and it was A-MAZING! I wanted to keep going back to it. Something about the chili powder and the carrot. But I have to say that after adding the rest and cooking them all the flavor was gone. I was super bummed. Did I do something wrong, or is there little taste to these once cooked? These definitely have flavour when cooked! As I said to the above commenter, I really don’t think chilli powder will ever be as good as using fresh chillis – they’re not really there for heat, more for the lovely flavour that most peppers get when they’re roasted, so I think that was probably the problem. Try using fresh chillis next time! Think I need to replace the carrot with chopped onion or pepper as I don’t like carrot – do you think that would work? 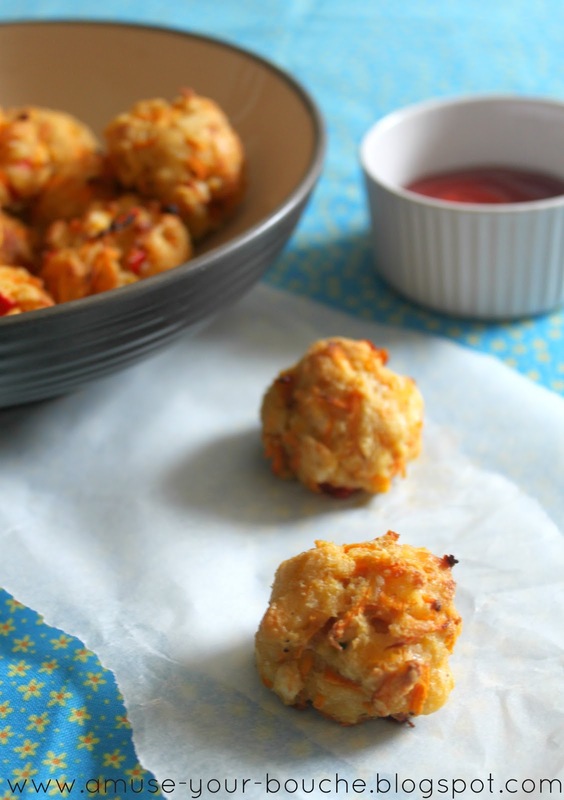 Ooo, these sounds so good…another appetizer to add to my Christmas dinner party..thanks! I made this for “Friendsgiving” this year and everyone loved it. 3 servings (60 balls maybe?) and it was gone very quickly. Thank you for this recipe. I cannot wait to try the others! oooh these look sooo good! mmmm! My second question is what is the dipping sauce in the picture? Thanks! Looks like a fun recipe! I’d do about 1/2 tsp of mild chilli powder but I really don’t think it would be as good. The chilli’s there for flavour more than for heat. Fresh chillis really aren’t scary, just buy mild ones and you’ll be fine! :) I’m not a fan of really spicy things either.